A website that serves as a mental health resource connection for families in Maine. A local non-profit specializing in providing mental health resources needed a website that was easy to update by staff members. Displaying testimonials and providing a glossary of terms was important to the client. 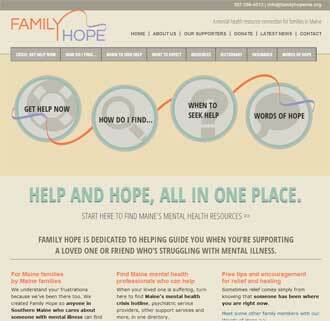 Graphic Details of Portsmouth, NH worked closely with the client and created a logo and page layout for Family Hope. The design was provided in a layered Photoshop PSD file. This design was used as a model to create a WordPress theme. The home page used custom fields to create a complex custom layout allow quick answers to visitors most pressing questions. The client also worked closely with an expert in SEO, providing good keywords and organization for the website’s content. Custom post types were developed for testimonials and glossary terms. Custom Admin pages were provided to allow staff members to easily add content for testimonials and glossary words and definitions. An easy to update WordPress website was developed for this non-profit organization providing mental health resources.